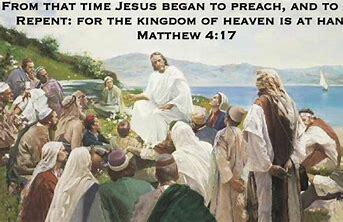 The Kingdom of Heaven is at Hand. | "Northern Crossings"
That is what John the Baptist said as he preached in the Judean wilderness and that is what Jesus said when He went about preaching teaching and healing and feeding and raising the dead and showing all the signs of what the Kingdom of Heaven looks like. This is a phrase that probably needs more thought than we give it. We pray “thy Kingdom come” in the Lord’s Prayer and if we are wise we look at what that means in the explanation in the catechism, and we here folks out there who say that when we do certain things we are making God’s Kingdom come among.us. We here some folks that used to equate a State or Government as the Kingdom of God. We probably need to be a bit more contemplative of the term and how it relates to our life in Christ. To make a dent in the issue we might start with the concept of the Kingdom of God being His rule over the hearts and minds of humanity. It doesn’t show itself in many places except the church and sometimes there it seems wobbly. Christians have always shown themselves to be very capable of ignoring what their King and the King of the universe says to them. When we are put under the Lordship of Christ everything in our orientation changes over and against the world, or fellow humand beings, the created order and the universe. This is a monumental all inclusive and extremely important phrase and anyone who is serious about Bible study has probably encountered John Bright”, monumental work called “The Kingdom of God”. Bringing this Child his body and his mind. The Attacks on Mercy Continue Why?